Congressman Raul Grijalva: "Ryan Zinke needs to resign immediately as Secretary of the Interior." 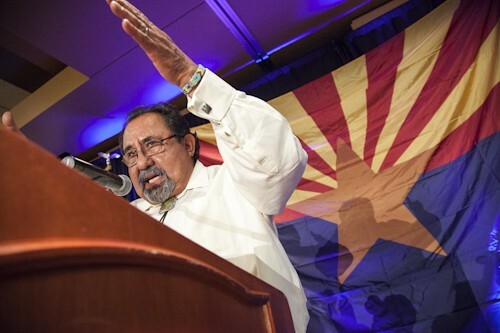 Southern Arizona Congressman Raul Grijalva today called for Interior Secretary Ryan Zinke to resign to avoid the scrutiny he will face when Grijalva takes over as chair of the House Natural Resources Committee when the House shifts to Democratic control in January. While the secretary continues to project confidence, questions have grown since the election about his future plans, and the White House reportedly fears that he would be unable to withstand scrutiny on Capitol Hill. Those fears are justified. Mr. Zinke has never even tried to offer an explanation for the sheer scope of his well-documented scandals. This silence is insulting to the American people, and given the Nov. 6 election results it is unsustainable. Continuing in office as though nothing has changed only shows how little Mr. Zinke has learned over the past year and a half. He holds his job as a public trust, not as a stepping stone to his further personal ambitions. He has abused that trust and damaged the Interior Department in the process. The least he can do is step down and give his successor a chance to begin reversing that damage. Zinke responded on Twitter by calling Grijalva a drunk. The American people know who I’m here to serve, and they know in whose interests I’m acting. They don’t know the same about Secretary Zinke.